• 275: Employees at Buck Knives’ Post Falls headquarters and plant. • 1.5 million: Buck Knives produced annually. • 87: Percentage of Buck Knives made in the United States. • $40 million: Privately held company’s annual revenue. • Factory tours: 10 a.m., noon and 2 p.m. Monday-Thursday. Visit www.buckknives.com or call (800) 326-2825. Buck Knives’ roots trace back to 1902, when 13-year-old blacksmith apprentice Hoyt Buck developed a method of heat-treating steel so that hoes and other tools would hold their edges better. But the business wasn’t launched until more than four decades later, when Hoyt and his son, Al, started handcrafting knives. Hoyt’s grandson, Chuck, began helping out when he was a teenager. 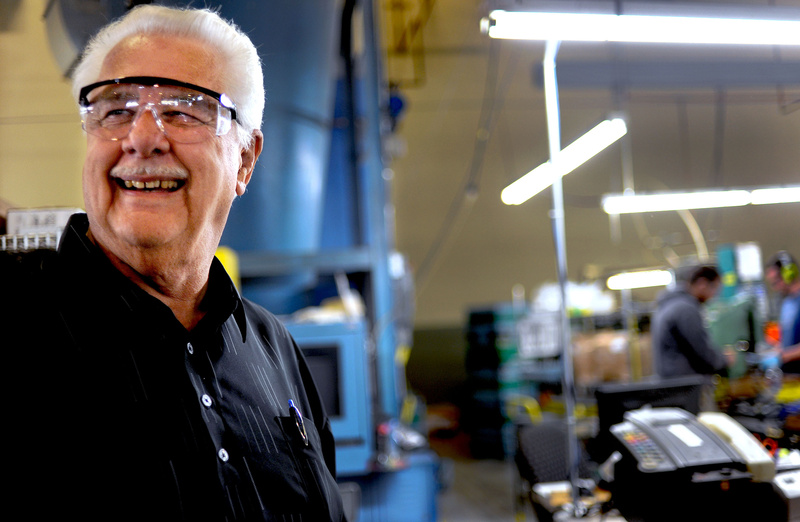 Now 75, Chuck is company chairman, and his own son and grandson work for Buck Knives. We spoke with Chuck Buck after touring the knifemaker’s Post Falls facility. S-R: What’s your earliest memory of the business? Buck: My dad and granddad were making knives out of old files, and I would grind the teeth off so Dad could mark the blade shape. I was about 13, and got a nickel a file. After my granddad passed away in 1949, we weren’t getting enough business in the spring, so I sharpened lawnmower blades and hedge clippers while Dad made knives. I never really got into shaping knives, but I do remember making a matched pair of throwing axes. I got $65 apiece for those. S-R: How did the company evolve from a two-man operation into an internationally recognized manufacturer? Buck: One night in 1961, after choir practice, the pastor of our church – a business-minded guy – told my dad, “Al, you need to incorporate, so you can buy equipment instead of literally keeping your nose to the grindstone.” And that’s what we did. S-R: How did you market those early knives? Buck: I ran the shop while Dad hit the road in an old Volkswagen camper. He’d go into a city and find the page in the phone book with all the sporting-goods stores, and that was his itinerary. Every day we’d get a batch of orders. Pretty soon we had 12 or 15 guys working for us. S-R: Your Model 110 is one of the most successful knives in history. Who came up with that? Buck: In 1963, we took three popular knives on the market – a couple of Canadian and one American – and we borrowed all their best features. Then we added brass bolsters and a wooden handle. The first ones were pretty rough, but police and the military started buying them, and soon we couldn’t make them fast enough. Since then, we’ve sold close to 20 million. S-R: How about variations of the 110? Buck: In the late ’60s, the aircraft carrier Ranger was in port in San Diego when a couple of sailors got into a fight and they both had 110s. So the captain said, “No more 4-inch blades.” That’s when we developed a 3-inch version of the 110, and of course we named it the Ranger. S-R: How many different knives do you offer today? S-R: How has the recession affected knife sales? Buck: Five years after we moved up here (from San Diego), things got a little rough, and we had to lay off 72 people. But we’re hiring again. We were nicely profitable last year, and this year looks even better. S-R: What’s the most expensive knife you sell? Buck: The limited edition stuff ranges from $400 to $500. S-R: And the least expensive? Buck: Probably a Chinese knife, at about $10. S-R: How many of your knives are made in China? Buck: About 13 percent. Walmart, our largest account, wants price points around $9, $12, $15, and it’s pretty hard for us to do that here. Most of our Chinese-made products go to Walmart. S-R: You were raised in Southern California. Have you adjusted to North Idaho? S-R: If you hadn’t been born into a knifemaking family, what career path might you have taken? Buck: Some sort of business. I love managing people, gaining their trust. My leadership philosophy is that if you help someone do a good job, they should get the credit. S-R: Any leadership decisions you regret? Buck: Back when we didn’t know how to make pocketknives, we contracted with a New York company. But their knives weren’t very good. Eventually we learned to make our own, and quit ordering from the other company. Then one day I got a call from the company’s president, telling me he had a few knives sitting around that he’d ground the Buck name off, and wanted to let some fellow sell them at swap meets. I worried that people would recognize them as Bucks. So I told him to send me what he had left, and I’d pay him $1 apiece. I was thinking maybe 2,500 knives. Three weeks later, an 18-wheeler pulled up with 60,000 of these reject pocket knives, and I was out 60 grand. S-R: What happened to the pocket knives? Buck: We ended up giving them to missionaries to pass along. S-R: How many knives do you personally own? Buck: Probably 500 or 600. The oldest is one my grandfather made when he was a pastor in Mountain Home, Idaho, in the early 1940s. S-R: Do you have a favorite knife? Buck: The one I carry – our little Vantage Model 342, which came out four years ago. S-R: Have you ever had to surrender a knife to airport security? Buck: No, but I did have to surrender knives to Canadian customs once. I’d been signing knives in Michigan and was on my way to L.L. Bean when I crossed over the border, and they asked me if I had any assisted-opening knives. I said, “Yeah, six.” I handed them over to the young lad, and he wrote up a receipt so I could pick them up on my way out. I wasn’t going back that way. But later at L.L. Bean, I met a physician who offered to pick them up for me. I gave him all the paperwork, he picked them up and returned them to me. I sent him a new kitchen set for helping me. S-R: Are there some really serious Buck Knives fans out there? Buck: We have a collector club with close to 2,000 members. Every five years they come to the factory, and we let them roam through the plant for two or three days. Those guys eat, drink and sleep Buck Knives. S-R: Imagine what they’d give for a Buck knife with a custom handle made from your bones. Buck: (Laughing) That ain’t gonna happen! Spokane freelance writer Michael Guilfoil can be reached via e-mail at mguilfoil@comcast.net.